Posing hard questions about adoption may well be one of the last surviving taboos in an America where any other raw, intimate topic has become ho-hum social media fodder. To publicly suggest that adoption isn’t the unilaterally positive, “win-win-win solution to a three-fold problem” that we have mythologized it as being, is often regarded as downright subversive, like, What’s wrong with you…??“. But Nancy Verrier had mothered both a biological and an adopted daughter, and felt the bone-deep differences. She plumbed the literature on bonding and attachment, child development and current adoption theory, to develop her theory of the primal wound, a separation trauma suffered by adoptees. She describes it as a wound that is “physical, emotional, psychological, and spiritual, a wound which causes pain so profound as to have been described as cellular…” (pg. xvi). All of this rhetoric ignores one simple but critical fact: the adoptee was there. The child actually experienced being left alone by the biological mother and being handed over to strangers. That he may have been only a few days or a few minutes old makes no difference. He shared a 40-week experience with a person with whom he probably bonded in utero, a person to whom he is biologically, genetically, historically and, perhaps even more importantly, psychologically, emotionally, and spiritually connected, and some people would like him to believe that it is the telling of the experience of the severing of that bond that makes him feel so bad! Perhaps the most infuriating myth pervading adoption is, the younger the baby the less potential for separation trauma or a primal wound. In reality, the younger the baby the more complicated the separation trauma may be, precisely because he or she doesn’t yet have the verbal skills, declarative memory or conceptual development to put words and descriptions and context to the “I’m dying” feelings of separation trauma. The infant or toddler doesn’t yet have the ability to differentiate the overwhelming terror sensations into “something happening to me” and… “this is me” categories. It all merges into the wee person’s sense of self. They are the trauma fire. And that is a primal wound. Yes, those immigrant children separated at the border who are 4 and 6 and 9 are going through hell, but part of what helps them through that experience, paradoxically, is the very fact that they have words and a declarative memory (not to mention compassionate people mirroring to them) that they are in fact going through a hellish experience. It is something happening to them; it isn’t a sensory overwhelm that merges with their very beings. A mountain of research has now piled up about prenatal learning and attachment, about the shaping nature of prenatal development. Newborns are capable, individual and aware. But society seems to have agreed to collectively ignore this inconvenient truth when it comes to adoption! It is one of our most staggering collective areas of ignorance as a society—a massive missing piece, which only adds to the primal wound for those of us who did suffer separation trauma. I’ll share one quick behind-the-scenes tidbit as I wrap up this longest-so-far introduction to one of my classic articles. When her book came out, Nancy, who is now a dear friend, became a hero to many adoptees and birthparents, and also to awake, compassionate adoptive parents who recognized that her information empowered them to be more loving, effective parents to their adopted children. But she also took a lot of flack and criticism. This was in 1994 when I was just hitting my stride writing for various adoption magazines, so naturally I wanted to step up and speak out. The original title to this article was “In Defense of the Primal Wound.” A couple years later, when I was going to republish it elsewhere, Nancy suggested that she didn’t feel she needed defending. Indeed, she did not. She deserved appreciation though, deep appreciation! A few years ago my husband was suffering from mysterious pain in his heels. The pain, and its intrusion on his lifestyle, was depressing for him, and even more depressing was the sense that this seemed to be one of those things that might never get explained but would, hopefully, just go away on its own. It didn’t, and he continued chasing down relief. One day he came home from the podiatrist happy and hopeful. He had seen his problem on the X-rays, he had seen in black and white exactly what was causing his pain. Real, tangible. There was a name for what was hurting him. There are no X-rays for hearts, for souls. There are only courageous people willing to step forward and speak of certain difficult truths. I’ll never forget the evening when I first read Nancy Verrier’s preliminary paper on her theory of “the primal wound,” in which she details how abandonment and loss is indelibly imprinted upon the unconscious minds and the biochemistry of those who have been separated from their biological mothers at birth. Verrier invokes established research to propose that bonding doesn’t begin after birth, but is a continuum of physiological, psychological and spiritual events beginning in utero and continuing throughout the post-natal bonding period. It is the interruption of this natural evolution, due to postpartum separation of mother and child, that creates a primal wound, according to Verrier, who went on to publish her findings in The Primal Wound: Understanding the Adopted Child. The descriptions I read in Verrier’s article sounded chillingly familiar, and I felt relief down to my bones, that someone finally knew me, saw me, understood the impossible ache/not-ache, this me/not-me that I had been living for so many years, in solitary. Fostering victims or voicing a difficult truth? Many people worry that the notion of the primal wound fosters victim status in adoptees. I propose that it simply acknowledges an existing condition through which some already feel like victims! I have had a fundamental problem with most self-help modalities and methods which stress changing behavior, changing attitude, and “re-framing” as their primary bases. They only added to my frustration and self-flagellation because I just couldn’t make those changes and re-framed realities “stick.” Yes, these approaches have been incredibly useful to me, but only after having walked into that emptiness inside me, and felt it—finally, deeply—and grieved it. This, in my hard-won experience, is what effective healing work is about: not “fixing” it, but facing it. Research powerfully supports the idea that a newborn adoptee has a deep, bodymind knowledge that his original mother isn’t the same woman who’s holding and feeding and cooing at him. Many studies show that a newborn knows its mother and will work very hard to obtain her over anyone else. Throughout our childhoods, although this deep knowing prods us down deep, telling us that something is vaguely, intangibly askew, we come to embrace out of sheer survival instinct the acceptance that everything is “fine,” because that’s what everyone says, everyone upon whom we depend. We gradually become alienated from our own inner knowing, which not only leaves us vulnerable—without our essential “inner compass” of what’s true—it can lead to a hollowness inside, a hollowness that can’t be filled by the busy details of our lives. There is a philosophy that proposes that we “choose” everything that happens to us—that each of our souls has a blueprint which selects life experiences and circumstances for that individual which will forge his or her soul to its true shape and hue. I would propose a paradox that requires we step out of our either/or, linear ways of thinking into a more inclusive, lateral-thinking mind-set: What if, for my true self to become manifest, I not only needed to experience being separated from my original mother at birth, but also needed acknowledgment and empathy for that very painful experience? For that has been my experience: prior to reading about and addressing the primal wound in my own life, I felt simply bound up by a vague constriction, what Jungian analyst / author Clarissa Pinkola Estes calls “the grinning depression.” Once Verrier’s words set a healing process in motion, I truly felt like the unfolding self I was designed to become, unfettered finally, and able, as Jungian psychologist James Hillman challenges, to “notice the fathering and mothering afforded by the world every day in what it sends” my way. I believe these to be very wise words. But to truly own that feeling of a burden, one needs to understand the nature of the burden. However, many adoptees have gone through their lives in the grip of an intangible burden—a burden with no definition, no resolution. It isn’t coincidental that to resolve means to “render distinguishable” the individual parts of an object, and it also means to “solve.” One, I believe, must precede the other. But there have been few opportunities in the lives of most adoptees to achieve the first kind of resolution. 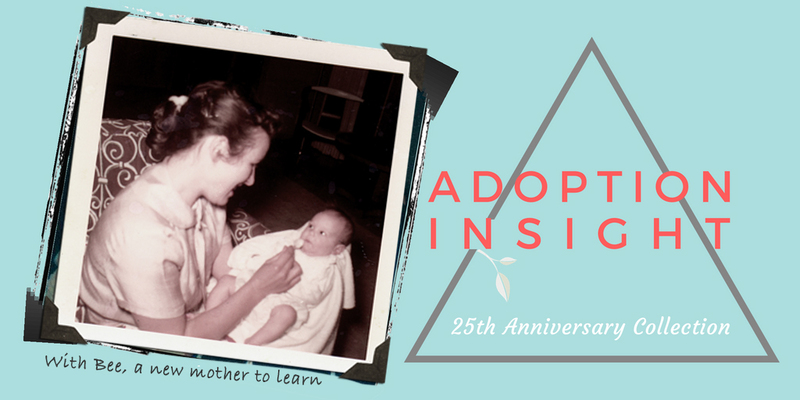 All eyes in our adoptive families were on the blessings, so ours had nowhere else to look. “We were so blessed that you came to us” was never balanced with “It was hard for you that you had to leave your other mother.” “You’re a precious part of our family” didn’t allow for, “I wonder if those blue eyes come from your birthmother or birthfather.” The burden, experienced by the adoptee pre-verbally and pre-cognitively, had no context, no language through which to be recognized as such. Dr. Severson says “to separate [blessing and burden] adds to the internal blights that we know as depression and denial.” But we are pressed into separating them through the simple non-acknowledgment of the burden. No one named our burden! Some object to the primal wound idea because they think it heaps “blame” upon birth mothers. I have never met a birth parent who feels that Verrier has assigned blame to her; only those who appreciated the difficult truths she has finally spoken, which often validate their own instinctive understanding of the profound effects of relinquishment on their children. This is not about guilt, and it is not about blame. It is about information. It is about knowing what really happened to you. That is what makes you sane. I agree that to treat adopted children as victims would cripple them in their ultimately solitary task of integration and healing. But even courageous lone travelers need the guidance of honest folks offering directions. I am grateful to have been offered just such a beacon, a map of one kind of injured soul. I thank Nancy Verrier for having the guts to stand up and speak aloud, finally, a gritty truth about adoption that has been lived silently in many, many hearts and souls. A chapter-length version of this article is found in the Adoption Insight Vol. II booklet What Is Written On The Heart~Primal Issues in Adoption, available here... ….. This entry was posted on Tuesday, July 17th, 2018 at 8:20 am	and is filed under Adoption Insight. You can follow any responses to this entry through the RSS 2.0 feed. You can leave a response, or trackback from your own site. Babies INDEED have awareness of what happens. There was an experiment done. Few moms late in their pregnancy had baby heart-rate monitors continually getting data. Meanwhile, fathers of these soon-to-be-born babies were in another wing of the university, and at random times they had been exposed to small electrical shock on their fingertips. Researchers compared timelines of baby heart rate and timing of father being in pain – and in ALL cases there was a very sharp correlation!!! Baby’s heart rate sped up as in ‘stressed-out’ exactly when their dad felt pain. I do energy work helping people change their lives in the direction they desire, and we often discover that the ‘glitch’ in their energy system [or ‘wound’] occurred very early on, months of days after birth. Thank you for your contribution to Peace on this planet! Thank you for your comment, Olga. We are indeed non-local beings whose deep workings (despite many interesting scientific discoveries) are still largely beyond our ken. I’ve met Dawson–cool guy!